"Nothing better than a classic from one of the most delicious cuisines, such as is the case of the Italian, in a romantic, cozy and pleasant atmosphere. If you are in Retiro neighborhood, the outlook can only improve. Trattoria di Brera meets these conditions to make you enjoy a memorable stay when it comes to eating, or provide you with a unique evening. Eggplant lasagna or the ossobuco alla milanese with mashed potatoes, are much more than the specialties of the house: they are the product of a careful cuisine cared for to the smallest detail. To the forever delicacies, a sweet touch of innovation and you have the soufflé of black chocolate with tobacco sauce and hazelnut ice cream. Don't miss the opportunity to enjoy a great meal and fantastic service. 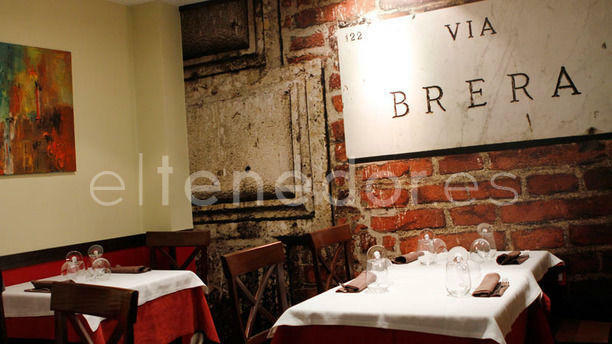 Trattoria di Brera is waiting for you." Excelent food, very good wine. Todo perfecto. Trato excelente. Repetiremos. Nice place, very nice boss and quality Italian food. Do not hesitate to go there (close to the Novotel Madrid Center). The chef was serving us and he was taking well care of us. We were with 8th and everybody was pleased with the chosen dish. I have taken the rissoto and it was really tasty. The other dishes : the pizza burratino, gargafelli and ravioloni and the carbonara. Afterwards we took the tiramisou, moelleux for desert! It was a nice evening with some good wine which was not expensive as well. One small remark it was warm inside but it was outside more 35°C. Congrats to the chef, we enjoyed it! ???? Basic decor, nice little neighborhood Italian restaurant with good food.